אפשרות הצגה pH או (mV / ORP (Redox voltage. 2 כניסות: ל pH ורגשי טמפרטורה מסוג RTD , NTC/ PTC. 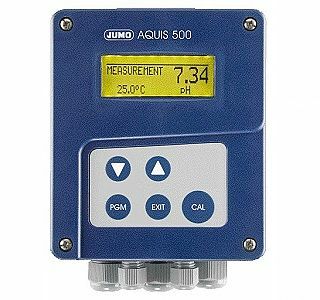 או 0(4) to 20 mA ו 0 to 10 V.
The device is used to measure/control the pH value, the Redox tension or for NH3 (ammonia) concentration measurement. The function can be changed directly at the device. Depending on the value to be measured, single-rod electrodes (e.g. pH/Redox single-rod electrodes, gas sensitive probes) or separate versions (glass/metal electrodes with separate reference electrode) can be connected. Temperature measurement is used as the second input value, which can be performed, for instance, with a Pt 100/1000. As such, automatic temperature compenstion is possible for the pH value and NH3. The devices are operated via self-explanatory keys and a large LC graphic display. This display allows a good legibility of the measured value. The parameter display in plain text facilitates configuration and supports the user in correctly programming the device. Due to the modular device structure, it can be adapted to the application requirements. Up to four outputs are available. (For functions, please refer to the block diagram). Universally applicable in the water and sewage water management, industrial, process and sewage water, drinking, well and surface water, leakage monitoring in cooling systems.